I chose the Granola labs, Granola Fruit Parfait and Granola Bars. These labs have been my favourite ones yet, therefore that is why I chose them to write about. This was my favourite lab because we made two dishes in realistically one lab. 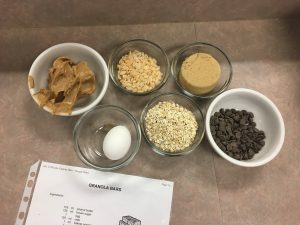 This lab is one I will defiantly use and home and is a very good and healthy snack which I like. 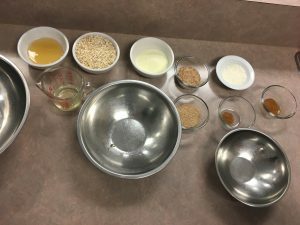 I fully enjoyed the lab as it was fun and was in a way suspenseful as the smells of the granola made you want to eat it quicker, then eating some of it, then having to wait another two days to taste the next part of it. Both products turned out just as planned, and I think that is because we all work really well and split up parts evenly, when sometimes we have ‘leaders’ and ‘quiet’ girls in our group. 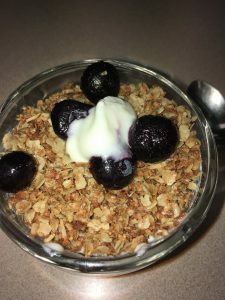 When I make both of these at home, at different times, I wouldn’t modify much, however, I would add more fruit to the Parfait and possibly small pieces of dried fruit to the Granola Bars with some yogurt dipped, and then cooled on the bottoms. Here is our mies-en-place for the Granola in the Parfait. Here is our Granola Parfait final product. Here is our mies-en-place for the Granola Bars. 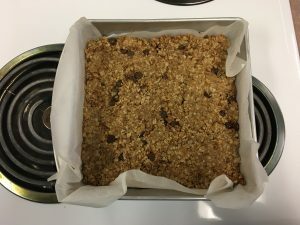 Here is our final product of the Granola Bars, before they are cut. Excellent work, Jayden. You explained your ideas a lot more.